Literature Cambridge is an independent educational organisation providing top quality courses on the best of English literature. Our courses are taught by leading academics and are open to all. Each summer course focuses on a particular author or theme. Taught by leading scholars in the field, they offer a rare chance to combine the study of literature with relevant walks, visits, and excursions. Our courses include lectures, supervisions, discussions and above all close reading, in the tradition of Cambridge English since the 1920s. We explore the historical context of the books, asking what they have to say about their own time, and how they speak to ours. 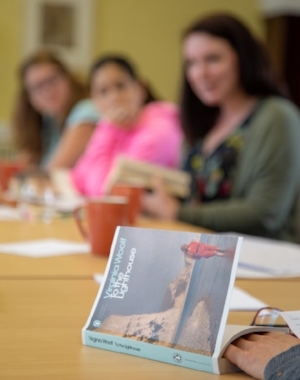 Our Woolf summer course in 2019 will be on Virginia Woolf's Gardens, 14-19 July 2019, followed by a week on Fictions of Home: Jane Austen to the Present Day, 21-26 July 2019. Bookings are open. In partnership with Stapleford Granary. Immersive day courses on individual writers or topics at the beautifully renovated Stapleford Granary just outside Cambridge. Full list of Study Days. How to get to Stapleford Granary. Our summer courses are structured around lectures and discussions, presented by leading scholars. Most days there is a Cambridge-style supervision, given to students in very small groups, and taught mainly by lecturers and post-docs from the University of Cambridge. Our short courses are taught by top academics, guiding students through intensive yet accessible lectures and discussions. Take time each day in the summer course to read and think, and share the fruits of your reading in discussions and supervisions. Our students are all ages from 17 to 70. Our summer courses are based in a Cambridge college. You live, study, and share some meals with the course participants. A rare opportunity to live and work with other keen students of your subject. Our 2019 courses will be held in the relaxed setting of Wolfson College. Our summer courses include walks, talks, and excursions in Cambridge. In 2018 our visits included a trip to the Wren Library at Trinity (above), Girton College, King's College, and other places of interest. There is nothing quite like studying in the beautiful city of Cambridge. Walking through the ancient colleges, you join generations of scholars who take the time to read seriously, and to think about that reading. The city is small, so you can get around by bus or bike or on foot. There are beautiful gardens in which to sit and think and do more reading. Throughout the summer there are superb concerts, art exhibitions, museums and films. Above all, you meet many amazing people who have come to Cambridge for sheer love of learning.